We indeed willingly concede, if any discussion arises over doctrine, that the best and surest remedy is for a synod of true bishops to be convened,where the doctrine at issue may be examined. Such a definition, upon which the pastors of the church in common, invoking Christ’s Spirit, agree, will have much more weight than if each one, having conceived it separately at home, should teach it to the people, or if a few private individuals should compose it. Then, when the bishops are assembled,they can more conveniently deliberate in common what they ought to teach and in what form, lest diversity breed offense. Again though, this does not necessarily mean that a council is infallible: "But I deny it to be always the case that an interpretation of Scripture adopted by vote of a council is true and certain." Calvin notes the shortcomings of the Second Synod of Ephesus for example. Contrary to this positive evaluation of church councils, In IV, 9:14 Calvin evaluates the Roman ideals and goals of conciliar decisions. 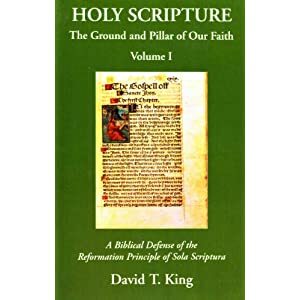 He argues the Romanists of his day ascribed a power to a conciliar decision in which councils strayed from interpreting scripture, but rather read doctrines into the scriptures. He cites purgatory, the intercession of saints, and auricular confessions as doctrines which were wrongly said to be the result of interpretations of scripture. Then he shows examples of things plain in scripture that have been interpreted by a council to mean other than what the text plainly says. He then concludes by noting that a council is not over scripture. That is, councils don't infallibly decide what scripture is or isn't. Councils are to be subject to scripture, not over it. The entire Romanist paradigm of absolute power over scripture, interpreting it contrary to the plain meaning, or reading doctrines into the scripture, is an abuse of a Godly council. Individuals can far more easily (wrongly) declare that their view is the "biblical" one. Calvin does this all the time. I do it myself (most people who do any theology at all, do it), but the difference is that we Catholics submit our judgments to that of the Church, and where we differ from the Church, we submit to her, even if we may not always fully understand. Anyone reading IV:9 of the Institutes has to wonder exactly how this interpretation serves as a response or addresses Calvin's lengthy arguments. Calvin has just noted the value of and cautions needed when the church meets in council. He addresses the meaning of true church authority (IV, 9:1-2). He addresses how it is that "truth" can exist even when it is downtrodden by the church (IV, 9:3-5). He addresses how truth can stand even if a council rejects it (IV, 9:6-7). He argues that councils still have value (IV, 9:8). He shows that councils sometimes go against councils, that they are still prone to human failure, and that they should not be followed blindly (IV, 9:9-12). Despite such problems, he argues for the value of councils (IV, 9:13). Calvin's entire argument takes multiple pages, each laid out with extensive Scripture references. Yet the Roman Catholic author passes over Calvin's entire argument. Note as well the response does not give a "Biblical Catholic answer." No appeal is made to a Romanist interpreted Bible verse in response to Calvin. What's given is a personal opinion or explanation of Romanism. Contrarily, the paradigm in explaining councils Calvin uses is Biblically based. In the Old Testament, God chose a people for himself. These people had an authoritative religion by which to lead and speak for God. Did that mean they were infallible? No. The Biblical record shows time after time, God would raise up individuals to proclaim the truth against the very leadership in the religion He established (see Institutes IV, 2:3; IV, 9:6-11). This same paradigm applies to the New Testament church. This doesn't mean the organized church is valueless because it can be corrupted by tradition and sin. It means that the church must continually conform itself to the word of God. Though Calvin doesn't address this, it's important to remember that Rome, meeting in Council, has infallibly interpreted very few Bible verses. Some Roman Catholic scholars admit no Bible verses have been infallibly interpreted. so when a Roman Catholic says they submit to conciliar interpretations of Bible verses, the fact of the matter is they're not submitting to anything at worst, or very little at best. The response given by the Roman Catholic author sees only two groups: those who submit to the Papacy and those who oppose it as out in the woods alone interpreting the Bible. Calvin though was a magisterial Reformer. He was not an Anabaptist. The Reformed tradition has an extensive history as an organized body, producing conciliar statements. Does this mean that the statements are of no value because those who made them were not infallible? Hardly. The statements are only as valuable as how well they conform to the infallible scriptures. A defender of Rome may counter argue: "but each person has to decide if that conciliar statement is Biblical." That is indeed the case. I admit that freely. It is the responsibility of each person to do whatever it takes to digest and comprehend God's truth. Each person is responsible for how they handle God's revealed truth. But the key is this: the Roman argument is a double standard, because each Roman Catholic still has to decide to trust Rome. There is simply no way around removing the personal choice of each person. One either uses their brainpower and decides to trust Rome, or one uses their brainpower to study the Bible. The Bible commands us to "Do our best to present ourselves to God as approved, a workmen who do not need to be ashamed and who correctly handle the word of truth." When a defender of Rome says, "...the difference is that we Catholics submit our judgments to that of the Church, and where we differ from the Church, we submit to her, even if we may not always fully understand." The defender of Rome isn't saying anything that a person picking up a Bible honestly would say. Further, the teachings of the Roman Catholic Church have to be interpreted and digested by each particular Roman Catholic, and they do disagree at times as to what Rome teaches.